I’m loading FreeBSD 7 onto my ancient Toshiba Satellite 2800; I plan to use it as a terminal for some servers. 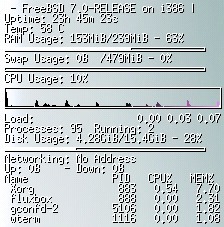 Conky displays system stats on my Fluxbox desktop. After much Googling and head scratching, I discovered that I had inserted an extra space behind the device specifier. Conky will not display anything if there is an extra character between the drive label and the end of the tag! So here is the fix.